There is much to look forward to in the new year. There will be a Raptors playoff run, a federal election, approximately 27 superhero movies, a new season of Fortnite and, of course, a barrage of new cars and trucks to tempt us out of our old jalopies. What’s old will be new again in 2019. Major automakers are looking to the past for sales success, reviving old models including the Bronco, Ranger, Defender, Gladiator and Supra. As new vehicle sales are on track to plateau after five years of record-breaking growth in Canada, automakers will need to try harder to tempt buyers. It’s no surprise many of these new models are SUVs; passenger cars continue to lose market-share to all manner of crossovers and sport utilities. Here are the most hotly anticipated new vehicles we expect to see in dealerships or unveiled on the auto-show circuit next year. The mid-engine Corvette is a mythic creature as elusive as Bigfoot or the Loch Ness Monster. Rumours suggested it would finally be unveiled at the Detroit motor show in January, but that appears not to be the case. Fans have been waiting for a mid-engine Corvette to rival the likes of Ferrari and Lamborghini since at least 1986, when Corvette unveiled the Indy concept car. If you’ve been waiting for 32 years, you can wait a few more months until mid-2019. The all-new 2019 Ford Ranger. Those who were hoping for a cheap mid-size pickup – a truck, in other words, similar to the old Ranger that was pulled off the market eight years ago – may be in for a shock. The 2019 model will carry a starting price of $30,969, with a standard 4x4 drivetrain. Ford is going after “lifestyle truck” buyers. The engine is a turbocharged 2.3-litre, paired with a 10-speed automatic transmission. The all-new Ranger arrives early next year, followed in the fall by a reborn Bronco SUV built on the same platform. The new 2020 Mazda3, unveiled at the Los Angeles auto show on Nov. 28, 2018. Unveiled at the recent Los Angeles auto show, the compact Mazda3 hatchback and sedan are among the cars we’re most looking forward to driving next year. The company said the all-new models will arrive in showrooms early in 2019, with a choice of either a 2.0- or 2.5-litre engine. All-wheel drive will be available as an option for the first time in the vehicle’s history. That, combined with its striking new design and luxurious interior, should give the Mazda3 a good shot at winning back customers who defected to bestsellers such as the Honda Civic and Toyota Corolla. The Taycan will be Porsche's first fully electric sports car. The term “Tesla-killer” is used flippantly, often as clickbait for online news stories. The fact is, no mainstream automaker has offered a direct rival to the Tesla Model S since its launch way back in 2012. Until now, that is. The Taycan, formerly known as the Mission E, will arrive in dealerships late in 2019 or early 2020. Two electric motors provide more than 600 horsepower and an estimated range of 500 kilometres (on the generous NEDC test). Fast-charging will be faster than Tesla’s, with 100 kilometres of range taking just four minutes to recuperate. Could this, finally, be a real Tesla-killer? Let’s wait to see how it’s priced. 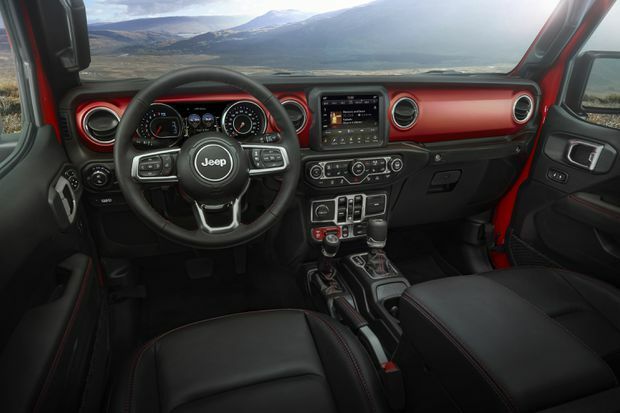 The interior of the 2020 Jeep Gladiator. Jeep hasn’t had a pickup truck in its lineup since Comanche production ended in 1992. Ever since, fans have been clamouring for a replacement. In 2019, they’ll finally get one. The Wrangler-based Jeep Gladiator will land in dealers in spring. A five-foot pickup bed, four (fully removable) doors and an off-road-ready 4x4 system are all standard equipment. As with the Ford Ranger, Jeep plans on selling this as a “lifestyle truck,” with a price to match. Don’t be surprised if it costs at least $45,000. Land Rover will reveal the 2020 Defender in 2019. The recently discontinued Defender was essentially the same as the original 1948 Land Rover Series I, which was key to its appeal. In England, they can be found in farmers’ fields or parked in Knightsbridge. There’s an all-new 2020 Defender coming, although there’s precious little information about it yet. Spy photos show a Tonka-truck-looking SUV, similar to the old LR4. If Land Rover has any sense at all, they’ll leave the Defender’s iconic design alone and modernize the chassis and running gear, as Mercedes did with the G-Class. A glimpse of the Toyota GR Supra Racing Concept. The affordable rocket from the land of the rising sun is making a comeback. For the Playstation generation, the mid-90s Supra is a holy grail, and rightly so. That twin-turbo, 320-horsepower coupe could embarrass European exotics in its day. The all-new Supra is being co-developed with BMW and will feature rear-wheel drive and BMW’s turbocharged straight-six engine. After years of concepts and spy photos, expect to see the production car at the Detroit show in January. As an impressionable young kid, I watched the Subaru Impreza win rally championships, flung sideways with turbo-popping abandon by Colin McRae, a.k.a. Colin McCrash. The Subaru WRX STI was my dream car. Oh, how the mighty fall. Subaru pulled the Impreza out of the world-rally championship a decade ago. Power output of the WRX STI plateaued around then too. An all-new WRX is due in 2019. Here’s hoping for a 400-horsepower hatchback that looks like Subaru’s 2017 Viziv Performance concept, but I’m reasonable, I’d settle for 350 hp. Come on Subaru.